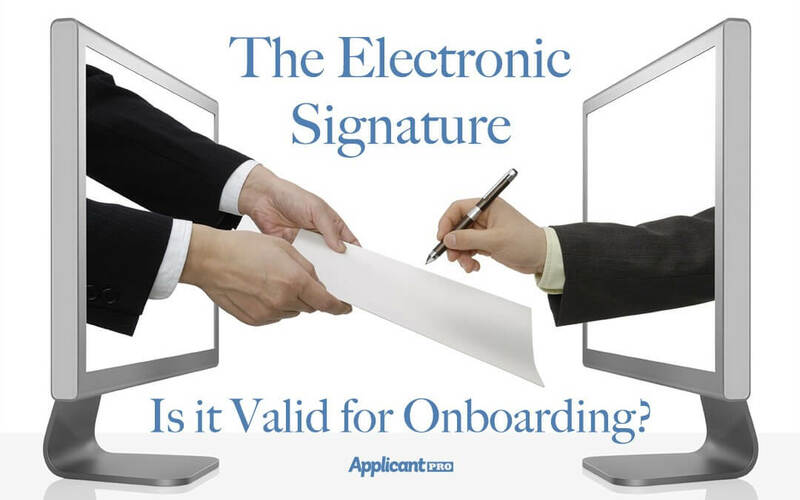 The Electronic Signature: Is it Valid for Onboarding? One of the questions that we at HireForms by ApplicantPro get asked all the time is about the validity of the electronic signature when used for onboarding documents. Usually this is in reference to the I9, but can also apply to non-compete agreements and other contracts. All I9 forms signed electronically must be legible, stored securely and backed up, be indexed for easy retrieval, be available for all parties, and the electronic signature must be affixed at the time of the transaction. While there is a lot more information contained in 8 CFR 274a.2 (e) through (i), the basics are that all I9 forms signed electronically must be legible, stored securely and backed up, be indexed for easy retrieval, be available for all parties, and the electronic signature must be affixed at the time of the transaction. You can read more here. What about the signature itself? The Uniform Electronic Transactions Act (UETA) passed in 1999 and the Electronic Signatures in Global and National Commerce Act (E-Sign Act) passed in 2000 were enacted to “make sure that transactions in the electronic marketplace are as enforceable as transactions memorialized on paper.” The UETA has been adopted by 47 states. The remaining states, Washington, Illinois, and New York, have codified provisions within their state laws functionally similar to UETA. The UETA defines the electronic signature as “an electronic sound, symbol, or process attached to or logically associated with an electronic record and executed or adopted by a person with the intent to sign the record.” Both the E-Sign Act and the UETA establish that electronic records and signatures carry the same weight and legal effect as traditional paper documents and handwritten signatures. “Records and signatures may not be denied legal effect, validity, or enforceability solely because an electronic signature or electronic record was used in its formation.” For purposes of the Act, nearly any electronic means of recording information may constitute an electronic record, and nearly any electronic evidence that a party has acted with the intent to sign a record may be an electronic signature. Both the new hire and the employee portions of the I9 can be signed electronically. That electronic signature is valid for the state and federal forms as well as many other documents. These electronic signatures can take many forms whether it is a wet-look signature made by signing with a mouse pad or finger, a typed signature, a symbol, or even just clicking an “I agree” button. All of this means that moving your manual paper onboarding process to an electronic option is compliant and easier than ever! The article is not intended to provide legal advice. Please address any questions or issues with your own legal counsel or compliance officer. The goal is to simplify some of the regulations on signing these documents electronically. If you have further questions on electronic signatures for onboarding or would like to learn more, please contact us.